Cast you minds back to another time and place and tell what the numbers 33 45 and 78 have in common??? Vinyl Records anyone? When I was a kid music came from a portable RCA record player. The sound quality wasn’t all that great, but somehow we didn’t seem to care. Later when I was a teenager, my parents got a fancy state of the art Phillips stereo cabinet and suddenly sound seemed to be coming from booth ends of the room. I never did understand how those old record players managed to pick up sound from the grooves in the vinyl to produce music. I still remember my father’s first reel-to-reel tape recorder, and then there were the eight-tracks, followed by cassettes, followed by CD’s. I can remember these things, but I have no idea how they made music. It doesn’t matter how many times people try to explain it to me, I still think it’s a miracle that such beautiful sounds can come out of machines. These days I don’t use records, tapes or CDs to listen to music. My music is stored in “the cloud” and when I want to hear I song I make sweeping motions on my iphone screen and presto, I can make music fill the room. I don’t know what the cloud is. I asked the personal assistant on my iphone, her name is Siri and she told me she was sorry but she couldn’t tell me because Steve told her not to tell anyone. Some people think the cloud is located in a 225-acre facility that Apple built in North Carolina. About the only thing I know for sure is that the cloud isn’t literally a cloud. But if I swipe the little cloud on my iphone it will play my music. No wires. Just music, my music: instantly, wherever and whenever I want it. I still don’t know how it works. But that doesn’t stop me from listening to my music. And now, thanks to even more technological wizardry, there’s video, beautiful videos on a tiny screen on my phone. I have no more idea how they get those tiny little people to perform inside of my phone, than I knew all those years ago when I wondered how they got music off those spinning discs of vinyl. Over the years technology has forced us to change paradigms so many times that most of us have given up thinking about how they do it. We are content to just enjoy the ease with which we can enjoy our music. At the same time as our thinking about the way we enjoy the simple pleasures of life has changed over time, so has the way we think about life. In our lifetime we have seen humans walk upon the moon. We have learned so much about the farthest reaches of space and time. Scientific laws that we learned in school have been laid aside and new theories about the origins of the universe have changed they way we think about the dimension of time and space that we currently inhabit. We have moved from believing that atoms were the smallest of particles as physicists have introduced us to subatomic particles and wowed us with talk of string-theory. Quantum physics is opening up whole new fields of inquiry as we peer deeper and deeper into the mysteries of the universe. Living in the age of information, the various academic institutions can no longer isolate themselves in their own particular field of expertise. And now Biblical scholars are working with the of historians, who are being informed by archeologists, and as our knowledge about the first century increases, theologians are being challenged by the implications of expanding knowledge. Preachers are being challenged to move beyond what they learned in seminary and parishioners are beginning to be introduced to ideas that once were the domain of PHD students. And all while all this is going on, science is opening up the mysteries of life in ways that our grandparents could never have begun to imagine. Mysteries that were once taken for granted as unknowable, are now being penetrated as minds capable of brilliance peer into the realm of possibilities. It is a marvelous time to be alive. It is also a challenging time to be alive. Some of us choose to shut down and retreat into the safety of fundamentalism, drawing the lines around what they can handle in the hope that they can remain safe and secure within the familiarity of what has always been believed about life on this planet. Others have simply thrown their hands up in exasperation and decided not to think any more than they have to; choosing to leave the stuff that hurts our brains to the experts as they turn their attention to the pressing needs of right here and right now. Others of us have embraced the various threads of knowledge that have come our way and tried to follow where they might be leading us. Like pilgrims in a foreign land we are looking all around us at the wonders and delights that are being revealed. And over and over again, our minds have been blown away by the glory of God that we see reflected in the mysteries of the universe. And just as surely as technology has forced us to re-examine our ways of living, science is forcing us to re-examine who we understand the make up of our universe, indeed to re-think how we understand not only creation, but the nature of our Creator. And as we ponder the possibilities we are beginning to feel excited. Because the road-blocks that once seemed impenetrable in our old ways of thinking are beginning to fall away as we begin to see that we may have wandered down into an unnecessary detour. As we begin to embrace the new realities being revealed to us by science, our understanding of who and what God might be is evolving almost as quickly as our understanding of what it means to be human. The marriage of ancient thought with modern science is opening up a whole new world for us to inhabit; a world where science has revealed the interconnectedness between the elements produced in the explosion of a super-nova to the very stuff that goes into creating the image that we see in our mirrors every morning. We now know that the iron in our blood and the calcium in our bones were created in the heart of some massive star, which exploded billions of years ago. We are as Joni Mitchell put it back in a simpler time stardust. Or are we? As quantum physicists begin to see connections explore the realms of sub-atomic particles and string-theory is born and suddenly we no longer live in a universe of 4 dimensions made up of 3 spatial dimensions and a fourth dimension called time. No, now we are beginning to learn that the universe may have as many as 11 dimensions. Theologians are beginning to speculate that God the creator of all that is and ever shall be may indeed inhabit the 12th dimension. As scientists begin to see particular connections between all living beings, theologians are beginning to re-examine the way in which we connect with the Being that lies at the heart of creation. Were once we looked to the grand-puppeteer in the sky to answer our prayers, we are now beginning to return to the wisdom of the ancient mystics who also saw prayer as a way of describing the connection between creatures and the Creator, and speculated on the various dimensions of time and space. It’s as if there has been a big bang in the recesses of our minds and suddenly we ideas, visions and inklings are cascading all around and in-between, as the infinite possibilities swirl to and fro, from without and from with in and we are left to try and make sense of it all within the confines of our finite lives. And the repercussions of this marvelous implosive explosion has left us longing to return to the day when all we had to do to ensure our place in the universe was to offer up a missive to the Super-puppeteer-in-the-sky. As our understanding of the life around us increases, our way of thinking about the connections that exist between us changes. Even though we may not yet understand those connections, we cannot ignore them. As old paradigms have been exchanged for new ways of thinking, knowing and connecting, our desire to connect continues. And so, we cannot help but seek to connect. And so, we pray. Under the old paradigm, God is reduced to little more than a jealous, judgmental, monster who stands idle as millions are incinerated in ovens born of evil; or wills the death of innocent babies, lets cancer steal the lives of the great and the glorious and lets murders walk free. Such a capricious idol is not worth the effort to worship and yet our need for connection leaves us reluctant to reject this monster of our imagining. But if we do reject the grand-puppeteer-in-the-sky, who is supposed to take care of us, to whom do we pray? Indeed, if move beyond the old paradigm, why should we pray at all? Moving beyond the known, willing to foray into the dimensions of the unknown we can begin to explore what prayer might become for us. Opening ourselves to that which is beyond who and what we are, opens us to the connections that exist between all that is. Encountering more that who we are, we are changed. As we open ourselves we begin to access the fullness of who we are, and to get an inkling of all that we were created to be. Connecting to the God who lives and breathes in with and through us, we begin to discover in our own depths a spiritual desire, an internal yearning, to be more deeply who we are, and thereby to become people who is more capable of giving ourselves to others. Prayer opens us to LOVE, which moves us to actions that embody LOVE. That’s what we mean when we talk about being Christ to one another. Its about being God’s LOVE in the world. Prayer opens us to the connections that exist in the cosmos, which changes us, and changes the world. Prayer raises to consciousness our need for connection, the connection itself, strengthens the bounds that exist between us; prayer strengthens the LOVE that holds us together. And we are only beginning to understand the powers of the ties that bind us together. But one things theologians are beginning to understand and I am beginning to feel, is that prayer is the activity that enables each of us to be givers to and receivers from one another of the deepest meaning of life—a meaning we call God. When we give up the idea that prayer is about changing the mind of some far off deity and embrace that prayer is way of opening ourselves to the God that dwells in with and through us, we can begin to understand the power of prayer to prepare us to be God’s love in the world. Prayer enables us not only to connect to the source of life, love, and being, but to provide that connection to the source of life, love and being to others. Prayer enables us to be more fully human, which in turn enables others to embrace their humanity. St Athanasius said that “Christ became human so that humans could become God.” Prayer is the activity that enables us to become more fully human so that God can live and breathe and have being in humanity. That, I believe is precisely why the apostle Paul insisted that we are to pray without ceasing. Prayer changes the way we live and move and have our being. When we pray without ceasing our life becomes our prayer. Our lives become God’s love in the world. This may be a new way of thinking about prayer for many of us. But the ancient mystics have being pointing us in this direction for centuries; science is only beginning to catch up with the mystics. Prayer is a powerful way of being in the world. Prayer connects us one to the other. Prayer opens us to God who is love. God continues to call us to be the incarnation of LOVE. So, pray without ceasing. Let your life be your prayer. So that in you, with and through you, God can live and move and have Being. Amen. 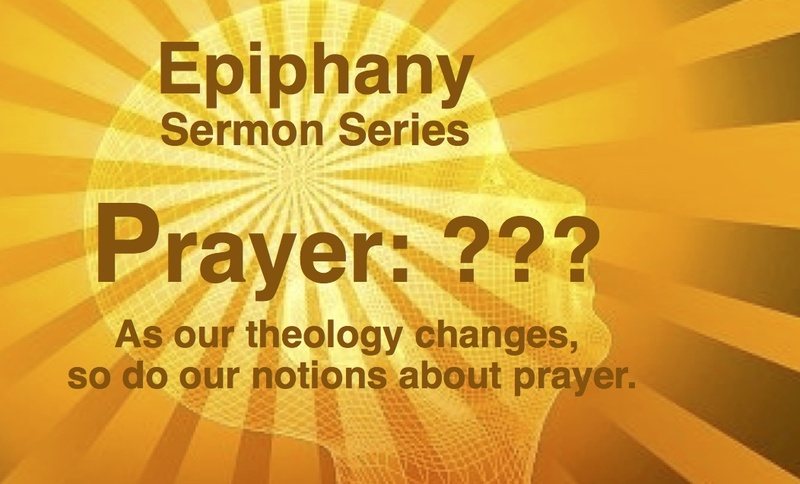 This entry was posted in Adult Education, Evolutionary Christianity, Progressive Theology, SERMONS, Theology and tagged evolutionary christian sermon Epiphany 6B, evolutionary christianity, Jesus, Lutheran sermon Epiphany 6B, Mark 1:40-45, power of prayer, prayer, progressive christian prayer, Progressive Christian sermon Epiphany 6B, progressive Christian sermon healing, progressive christian spirituality, progressive theology, spiritual but not religious sermon, spirituality, Transfiguration Sunday by Rev. Dawn Hutchings. Bookmark the permalink.